Dr. Anita Kaplan, dean of bachelor’s degree programs and chair of the Stewart Awards Committee, announced the winners during Convocation Tuesday where College administrators welcomed back faculty and staff for the start of the 2018-2019 new academic year and updated them on new initiatives. A 10-member committee picked the winners from among 20 applicants for the award that includes a $5,000 cash prize. Dr. Anita Kaplan and Dr. Roger Yohe congratulate Professor Nataliya Romenesko. “I feel incredibly proud and honored to be recognized with this award. 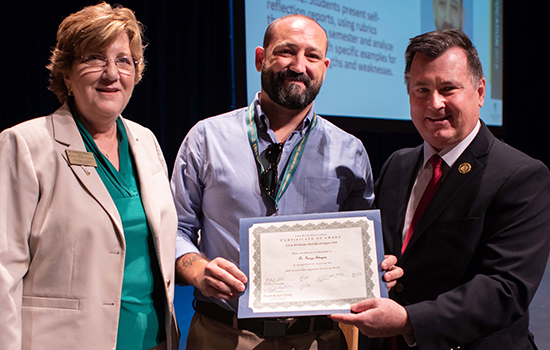 Palm Beach State College is a special place, and my colleagues and students inspire me to keep learning and improving my teaching,’’ said Stoupas, associate professor of Human Services in the Addiction Studies program. The Stewart Awards, open to all full-time and part-time faculty and instructors, began in 2006 with a grant from the Douglas and Virginia Stewart Foundation. The College selects two winners each year. Stoupas was chosen for his “Check Yourself Before You Wreck Yourself,” project used in his Group Counseling in Substance Abuse course. It involved students reflecting on their social-emotional skills in the classroom, which is expected to help them in the workplace and in their private lives. He said students presented self-reflection reports, using rubrics throughout the semester and analyzed their ratings with specific examples for both their strengths and weaknesses. “One of the biggest gifts I get as a teacher is encouraging students as they learn about themselves. My hope is that I can help them grow and be successful in whatever path they choose,’’ he said. 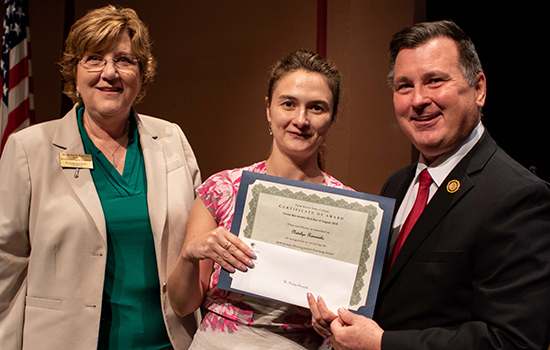 Romenesko was honored for an assignment in her Introduction to Literature course requiring students to explore, read and write various forms of Literature through discussions of common narrative elements such as short stories, poetry and literature. Through a Book Project, students form small groups and are tasked to co-author a children’s book of their own. She said students, among other things, must demonstrate an understanding of literary analysis, interpretation and analyze the characteristics of a particular literary work, including proper use and interpretation of literary terminology in fiction. As part of the self-nomination process, professors must demonstrate that they go above the norm by developing, implementing, assessing and analyzing innovative learning practices to help students succeed in reaching their academic goals. Visit the Stewart Awards website to learn more about the requirements and past winners. Visit the Flickr album to view more pictures from Convocation. Congratulations, George and Nataliya! Well done! Congrats! Always great to see the best of the best receiving rewards and recognition. Congratulations Professors!!! Well deserving of this award, both of you!